Glock 42 - Ain't this the cutest little thing you 'ever seen? Could not help showing off my new acquisition. The Glock 42 .380 Auto. The Glock 17 (9mm) is just for perspective. The lip on the mag is a Pearce Grip (http://www.pearcegrip.com/Products/GLOCK). The regular base plate is just flat. 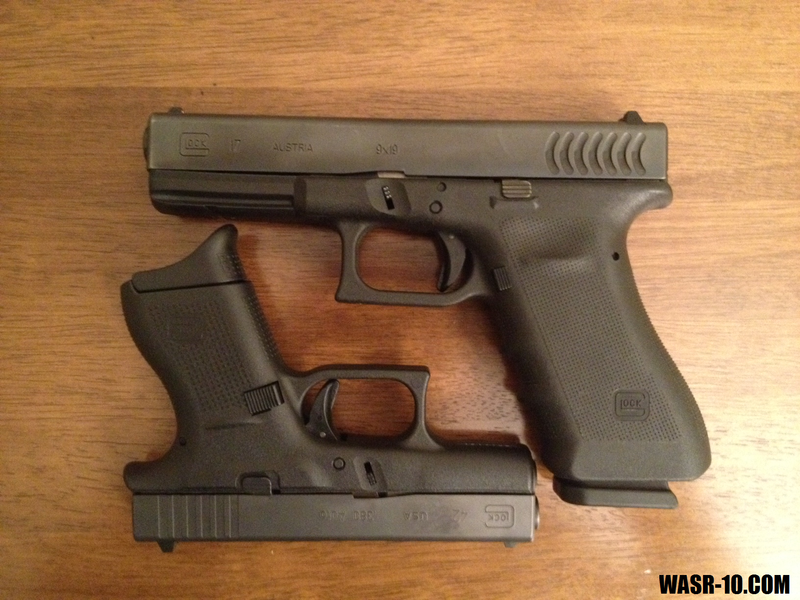 Nice glock, I looked at one of those before I decided on the M&P bodyguard 380 without laser because of it being smaller. I am sure you will enjoy shooting it and it will be a lot more comfortable to carry over that 17. Yeah took me a little to convince myself that carrying 6 +1 was going ok but the comfort level is so much better plus at 14oz loaded is a plus.